CAPTION: Mountains and water and trees, oh my! And funny costumes, too! The Fall opens with a disembodied symphony of black and white images done to the tune of Beethoven’s 7th where the beauty is in not fully understanding what you are watching. There’s a train, a bridge, a man in the water, a rope, and the hoisting up of a horse from the river. And there’s one quick shot of actress Karen Haacke, looking shocked and dreadfully beautiful as she (and not yet the audience) realizes what has happened that made my jaw drop. Some movies, like the Indiana Jones films, are designed to evoke fond feelings from other movies. Then there are films like Tarsem “Don’t Say My Last Name” Singh’s The Fall, which exists to tell a tried and true story with new images we have never seen before. When we last met Tarsem, he gave us the trippy crime flick The Cell in which we were made to feel sympathy for a serial killer who literally became trapped inside Jennifer Lopez’s head–talk about HELL! With The Fall, Tarsem, wanton and reckless, creates a tenuous relationship with the audience as he weaves the tale of broken-hearted silent film era stuntman (Lee Pace) who suffers a severe injury after a foolish stunt (seen in the opening) and forms an unlikely friendship with a migrant farm girl (Catinca Untaru) who broke her arm falling from a tree while picking oranges. The Fall shares some thematic similarities with Terry Gilliam’s The Adventures of Baron Munchausen and the Polish Brothers’ Northfork as Pace’s character begins to construct an elaborate fantasy world for the little girl to pass the time. The images Tarsem creates are breathtaking, strange, and confounding and like nothing seen in modern cinematic myth-making. The vibrant director uses visual and textural transitions from scene to scene (witness a butterfly turn into an island, or spilled coffee turn into blood) like it’s nobody’s business. 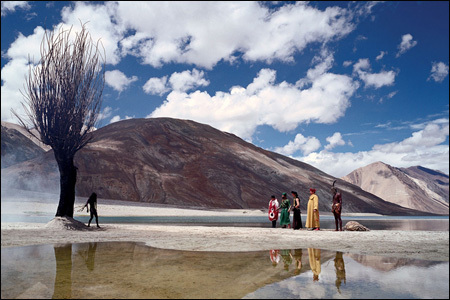 The Fall is a true independent film, shot over the course of four years in twenty-eight different countries and funded primarily by Tarsem himself (with some last minute help from contemporaries David Fincher and Spike Jonze). With no CGI alterations, part of the fun is trying to figure out how some of the scenes were shot. Sometimes distracting is trying to determine where they were shot–as I believe one of the scenes was done (is it even possible?) outside India’s Taj Mahal. There’s sometimes an undercurrent of malevolence in the imagery, and often it is so over-the-top in its pageantry as to become incomprehensible inside the grander scheme of the simple fairy tale. Paradoxically it also reaches the level of silliness as one scene involving the overly dramatic death of a monkey named Wallace had me laughing so hard I almost cried. Meanwhile, the acting verges on amateurish. Justine Waddell in her dual roles as a nurse and princess is stunningly gorgeous but vapid. In the lead role, Pace, ranges from wooden to overly emotional, while the pint-size Untaru is so uncommonly naturalistic one wonders if she even realizes she was playing make-believe. These follies can be forgiven, though, as the movie celebrates the power of imagination and the lore of films. Where else are you going to find a man shot to death with dozens of arrows only to fall on his back and be held suspended by the very instruments of his death? Believe me, the scene is amazing. The Fall succeeds as a movie for true film buffs. Critics like Roger Ebert, who sincerely love movies and their power to entertain, have raved about it, while others more cynical have dismissed it as a moving coffee-table book of empty modern art. Viewing it as a midweek matinée, I witnessed the only other patrons walk out, while some ushers looking to pass the time, sat in on the last ten minutes, which featured a montage of silent film era stunts that gloriously celebrated the old images that astounded their audiences just as much as Tarsem’s new images attempt to astound us. The ushers seemed to get a mad kick out of it, and so did I. Is Serena the Worst Book to Film Adaptation in the History of Cinema?